The Transrapid Test Facility first opened in 1984 at Emsland, Germany. Several generations of Transrapid trains have been tested on the 31.5-km track since then. The Transrapid 07 has covered a distance of more than 550,000 km at Emsland. More than 220,000 paying passengers from all over the world have ridden Transrapid on demonstration runs at speeds of up to 420 km/h. 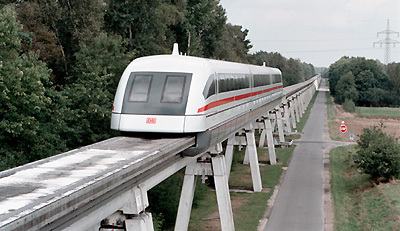 On June 10, 1993, the Transrapid 07 established a world record for passenger-carrying maglev vehicles when it reached a speed of 450 km/h (279mph). The Transrapid 08, a 3-section, passenger train began operating in 1999 and was built to obtain the type approval certification required for commercial operations. Designed for 550 km/h operation, the new train is lighter, more aerodynamic and quieter than its predecessor, the Transrapid 07.